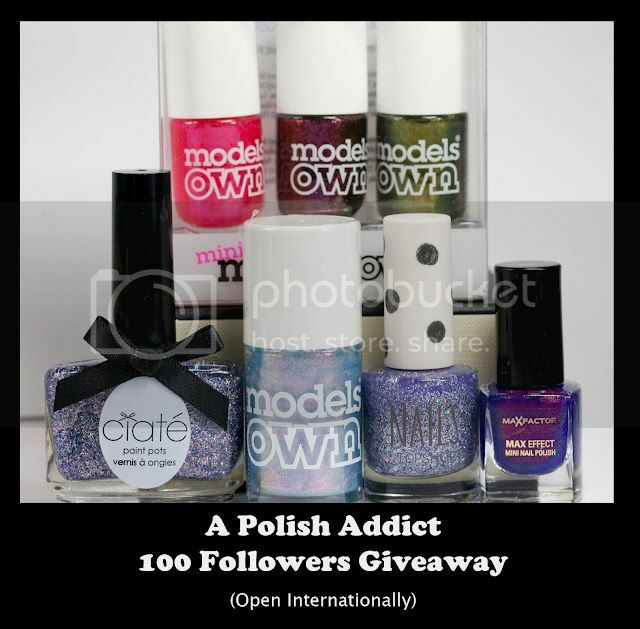 The lovely A Polish Addict is hosting a 100 Followers Giveaway to celebrate her achievement of 100 followers on her blog! Items in this giveaway includes the Max Factor Fantasy Fire, Models Own Indian Ocean, Models Own Beetlejuice mini set (Pink Cocktail, Pinky Brown and Golden Green), Ciaté Jewel and Topshop Razzmatazz, all of which are awesome polishes! One lucky winner will be chosen to win all awesome and lovely prizes! The giveaway is open internationally and closing date is 23 April 2012. Good luck!